The skincare products are used for different skin related concerns, skin beautification and treatments. These skincare products contain natural elements, medicinal herbs and chemical ingredients so that when applied on the skin can maintain texture of the skin, avoid early aging, pimples and enhance beauty. With the development of organic skincare products and growth of e-commerce platforms the global skincare product market is rising. The demand of these skincare products is growing among the younger consumers than the older ones. Goldstein Research analyst forecast the skincare products market size is set to reach USD 189.82 billion by 2024, growing at a CAGR of 5.90% over the forecast period. Skincare products requests have increased by 69.0% from 2016 to 2024. The global skincare products market has proven its capability to attain a stable and continuous growth even in unfavorable economic conditions. The report covers the present ground scenario and the future growth prospects of the skincare products market for 2016-2024 along with the number of players providing a wide variety of skincare products. We calculated the market size and revenue share on the basis of revenue generated from major players across the globe. The market is forecasted on the basis of parameters like number of products available in the market, target audience statistics, data related to online consumers and total number of major players in the market. On the basis of product type, largest revenue share of 59.0% in the global skincare products market is accounted by face creams in 2016 and is likely to maintain its dominance throughout the forecast period. There is a huge demand for skin brightening products by the consumers as these products hide scars, black patches, age spots and diminish the pigmentation from the skin. Some products have medicinal herbs that can be used to treat melasma, hyperpigmentation, rosacea and vitiligo. This segment is expected to grow in the coming years with the increase in working women worldwide and availability of the beauty products. Skincare products market outlook 2016-2024, has been prepared based on an in-depth market analysis from industry experts. 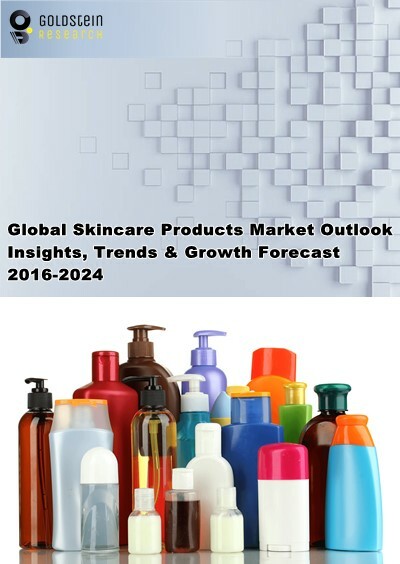 The report covers the competitive landscape and current position of major players in the global skincare products market. The report also includes porter’s five force model, SWOT analysis, company profiling, business strategies of market players and their business models. Global Skincare Products market report also recognizes value chain analysis to understand the cost differentiation to provide competitive advantage to the existing and new entry players. Our global Skincare Products market report comprises of the following companies as the key players: Johnson & Johnson Services, Inc., Estee Lauder Companies Inc., Unilever PLC, Avon Products Inc., L'Oréal S.A., Kao Corporation, Colgate-Palmolive Company, Shiseido Company, Beiersdorf AG, and Procter & Gamble. Other high-flying vendors in the market are: Innisfree, The Body Shop, Bath And Body Works, Lush, Enchanteur, Clarins, Clinique, Chanel, Nivea, SK-II and LAMER. According to our global market study on the basis of extensive primary and secondary research: “one of the major trends in the global skincare products market is the strengthening of online distribution channel due to growing competitive intensity on social media like Facebook, Instagram, Snapchat, etc. The skincare brands are using online virtual experiences such as Sephora’s virtual artist offers a fun and easy tool that can be used from the laptop or mobile to digitally try on different products. According to the report, major driving factor for skincare products market is the growing demand of the organic personal care and cosmetics products estimated to reach the valuation of USD 18.9 billion by 2024. These products are made from plant extracts and natural ingredients and contain very low amount of synthetic ingredients. The uses of organic products are increasing as the government organizations in various countries are encouraging the use of these products. Further, the report states the major challenge lack of transparency around the concept of e-commerce skincare products due to fake number of influencers that may or may not be a real person. There are so many brands that have been fooled or could be fooled by these fake influencers. Based on geography Asia-Pacific held the largest market share i.e. 52.0% in global skincare products market in 2016 due to high demand in the skin-brightening creams. Many players are coming up with skincare products that have UV absorbers to protect skin and reduce tanning. North-America is expected to grow over the forecast period as people are concentrating more on the organic skincare products. The US anti-aging lotion market generated about USD 1.5 billion in 2016. The rising demand for the personal grooming products for both male and female will drive the global skincare products market. What is the revenue of skincare products in 2015-16 and what would be the expected demand over the forecast period? 8.2.1. Johnson & Johnson Services, Inc.
8.2.2. Estee Lauder Companies Inc.